STANLEY ANN Dunham Soetoro with son Barack in Hawaii. MS. SOETORO during her field trip from 1988 to 1992. She died of ovarian cancer in 1995. MS. SOETORO on her Indonesian trip. IN THE capsule version of the Barack Obama story, his mother is simply the white woman from Kansas. The phrase comes coupled alliteratively to its counterpart, the black father from Kenya. 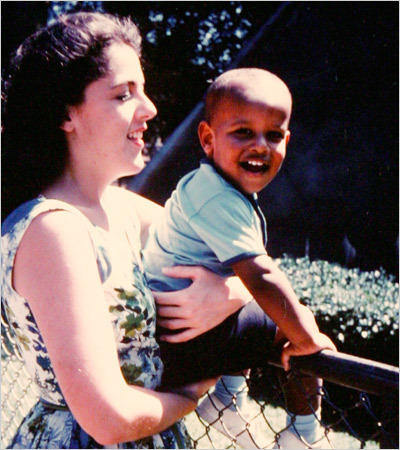 On the campaign trail, he has called her his “single mom.” But neither description begins to capture the unconventional life of Stanley Ann Dunham Soetoro, the parent who most shaped Mr. Obama. She had high expectations for her children. In Indonesia, she would wake her son at 4 a.m. for correspondence courses in English before school; she brought home recordings of Mahalia Jackson, speeches by the Rev. Dr. Martin Luther King Jr. And when Mr. Obama asked to stay in Hawaii for high school rather than return to Asia, she accepted living apart – a decision her daughter says was one of the hardest in Ms. Soetoro’s life. Ms. Soetoro, who died of ovarian cancer in 1995, was the parent who raised Mr. Obama, the Illinois senator running for the Democratic presidential nomination. He barely saw his father after the age of 2. Though it is impossible to pinpoint the imprint of a parent on the life of a grown child, people who knew Ms. Soetoro well say they see her influence unmistakably in Mr. Obama. They were close, her friends and his half-sister say, though they spent much of their lives with oceans or continents between them. He would not be where he is today, he has said, had it not been for her. Yet he has also made some different choices — marrying into a tightly knit African-American family rooted in the South Side of Chicago, becoming a churchgoing Christian, publicly recounting his search for his identity as a black man. Some of what he has said about his mother seems tinged with a mix of love and regret. He has said his biggest mistake was not being at her bedside when she died. And when The Associated Press asked the candidates about “prized keepsakes” – others mentioned signed baseballs, a pocket watch, a “trophy wife” – Mr. Obama said his was a photograph of the cliffs of the South Shore of Oahu in Hawaii where his mother’s ashes were scattered. He has described her as a teenage mother, a single mother, a mother who worked, went to school and raised children at the same time. He has credited her with giving him a great education and confidence in his ability to do the right thing. But, in interviews, friends and colleagues of Ms. Soetoro shed light on a side of her that is less well known. Her parents were from Kansas – her mother from Augusta, her father from El Dorado, a place Mr. Obama first visited in a campaign stop in January. Stanley Ann (her father wanted a boy so he gave her his name) was born on an Army base during World War II. The family moved to California, Kansas, Texas and Washington in restless pursuit of opportunity before landing in Honolulu in 1960. In a Russian class at the University of Hawaii, she met the college’s first African student, Barack Obama. They married and had a son in August 1961, in an era when interracial marriage was rare in the United States. Her parents were upset, Senator Obama learned years later from his mother, but they adapted. “I am a little dubious of the things that people from foreign countries tell me,” the senator’s grandmother told an interviewer several years ago. The marriage was brief. In 1963, Mr. Obama left for Harvard, leaving his wife and child. She then married Lolo Soetoro, an Indonesian student. When he was summoned home in 1966 after the turmoil surrounding the rise of Suharto, Ms. Soetoro and Barack followed. “She always felt that marriage as an institution was not particularly essential or important,” said Nina Nayar, who later became a close friend of Ms. Soetoro. What mattered to her, Ms. Nayar said, was to have loved deeply. By 1974, Ms. Soetoro was back in Honolulu, a graduate student and raising Barack and Maya, nine years younger. Barack was on scholarship at a prestigious prep school, Punahou. When Ms. Soetoro decided to return to Indonesia three years later for her field work, Barack chose not to go. That time apart was hard for both mother and son. 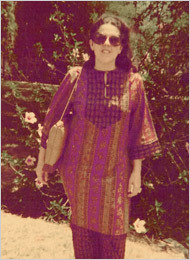 “She longed for him,” said Georgia McCauley, who became a friend of Ms. Soetoro in Jakarta. Barack spent summers and Christmas vacations with his mother; they communicated by letters, his illustrated with cartoons. Her first topic of conversation was always her son, her female friends said. As for him, he was grappling with questions of racial identity, alienation and belonging. Fluent in Indonesian, Ms. Soetoro moved with Maya first to Yogyakarta, the center of Javanese handicrafts. A weaver in college, she was fascinated with what Ms. Soetoro-Ng calls “life’s gorgeous minutiae.” That interest inspired her study of village industries, which became the basis of her 1992 doctoral dissertation. She became a consultant for the United States Agency for International Development on setting up a village credit program, then a Ford Foundation program officer in Jakarta specializing in women’s work. Later, she was a consultant in Pakistan, then joined Indonesia’s oldest bank to work on what is described as the world’s largest sustainable microfinance program, creating services like credit and savings for the poor. Visitors flowed constantly through her Ford Foundation office in downtown Jakarta and through her house in a neighborhood to the south, where papaya and banana trees grew in the front yard and Javanese dishes like opor ayam were served for dinner. Her guests were leaders in the Indonesian human rights movement, people from women’s organizations, representatives of community groups doing grass-roots development. Ms. Soetoro-Ng, who herself became an anthropologist, remembers conversations with her mother about philosophy or politics, books, esoteric Indonesian woodworking motifs. One Christmas in Indonesia, Ms. Soetoro found a scrawny tree and decorated it with red and green chili peppers and popcorn balls. “She gave us a very broad understanding of the world,” her daughter said. “She hated bigotry. She was very determined to be remembered for a life of service and thought that service was really the true measure of a life.” Many of her friends see her legacy in Mr. Obama – in his self-assurance and drive, his boundary bridging, even his apparent comfort with strong women. Some say she changed them, too. She died in November 1995, as Mr. Obama was starting his first campaign for public office. After a memorial service at the University of Hawaii, one friend said, a small group of friends drove to the South Shore in Oahu. With the wind whipping the waves onto the rocks, Mr. Obama and Ms. Soetoro-Ng placed their mother’s ashes in the Pacific, sending them off in the direction of Indonesia. 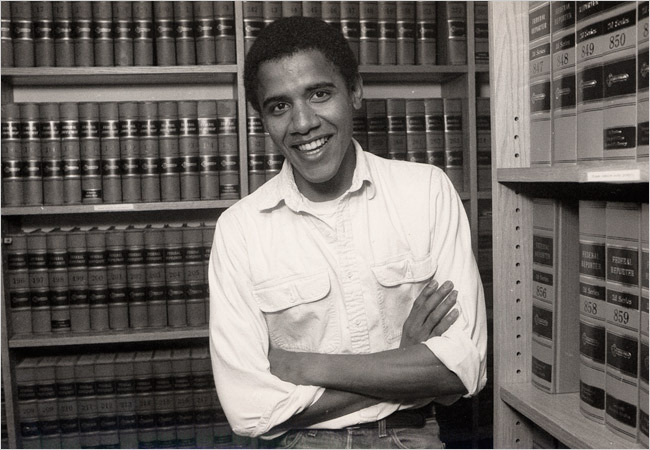 BARACK OBAMA in 1990 when he was elected president of the Law Review at Harvard.